It seems like months since I have been on a mountain bike so I was glad when the weekly MTB rides at Harvey Bear Ranch started up again. HBR is close by and easy to get to and the trails, although somewhat steep in places, are not that difficult. About 6 of the “Nightriders” showed up for the ride. It was great weather, even though we are still in March. 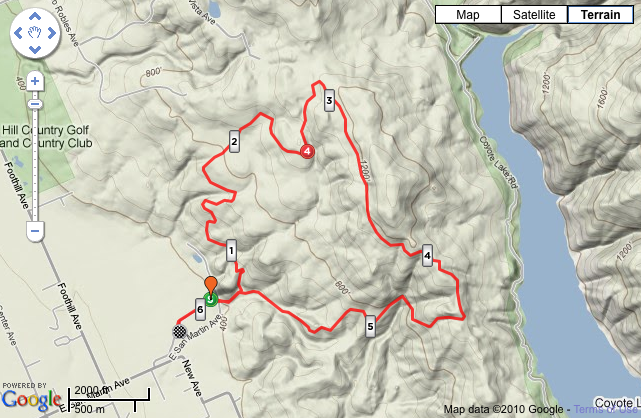 I took my new Garmin Edge 500 on the ride and was able to later download the data and get a map of where I went. I had to cut the ride short today because it was my birthday and we were going out to dinner. I uploaded the data file to a website called Strava. You can see all the details here. It lets you name some of the climbs you discover with the Garmin GPS. I needed to figure out the name of the major climb we did, so I found this map of Harvey Bear Ranch and saw the name was Harvey Bear Trail. Click the image below to download the full Harvey Bear Ranch map. I have a few major things on my bucket list that I checked off in the last few years, but one that I had not yet accomplished was to ride the Moab White Rim Trail in a single day. I have ridden it before but in 3 days so I knew that although the trail is not that technical, with over 100 miles with no water sources, over 6,000 feet of climbing, sand, and pounding from the terrain, finishing it in a single day makes it a monster ride. 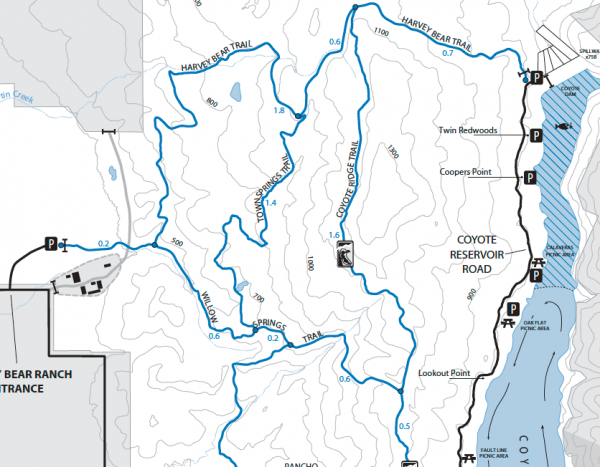 A couple of weeks ago my brother Mike called and let me know they were going to attempt to do the White Rim Trail in a day and thought they would have a spot for me. I knew my friend Jim would also be interested so I checked if there was a spot for him, which became available. 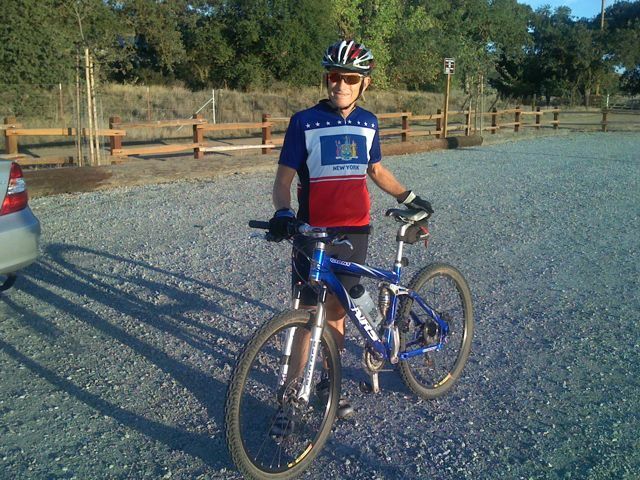 It was short notice and no time to do much training on the mountain bike so it was relying on my road bike training. I figured I had a fairly good chance of finishing but was not fully confident. There was going to be a vehicle to follow the riders to carry water and food, and provide the only bail out if someone could not make it. On Thursday Jim and I made the long drive from California up to our second home in Orem, Utah. On Friday afternoon, Mike came by to pick us up for the drive to Moab. Mike and Stu’s bike were in the bed so we loaded Jim and my bike on a rear mounted rack. It was dark by the time we arrived in Moab. The four of us checked into the motel and then met Rian, Vint and Jack who had driven from Colorado. Jack had offered to drive Mike’s truck along the route and be our support vehicle, supporting the 6 riders (2 from California, 2 from Utah and 2 from Colorado). We decided at dinner to leave in the morning at 5 am. First stop was Denny’s, the only place open at that time to get some breakfast. From Moab it is a 30 mile drive out to the White Rim Trail. The trail itself does not form a complete loop so there is a section of connecting the two ends of the trail with 14 miles on a dirt road and then about 7 miles on a paved road. Some people do the White Rim in a Day by skipping these miles, having someone shuttle them, but we wanted to do the entire loop and finish where we started. We drove the 14 miles out on the dirt road and parked at the top of the Horsetheif Trail Climb. Our biking route would then be going back on the 14 miles of dirt road to the highway. Our plan was to start biking around 7 am, just before civil twilight. After getting a group shot we started at 7:15 am. It was now barely light enough to start without a light. We rode the 14 mile dirt road section back to the highway and ended up with 1,600 feet of climbing. The sun was now fully up so we decided to take off some of the clothing and put it in the truck. That stop cost us 7 minutes. It had been decided earlier to send the truck ahead at this point so it could get down Shafer Trail before we did since we could descend faster than the truck. We biked another 7 miles on the paved highway to the park entrance where we had to stop and pay the entrance fee. There was no one manning the entrance booth to take the fee and we didn’t want to bike an extra 2 miles to the visitor center to pay it. Luckily we noticed a drop box we could put in our $5 each in an envelope. Soon after the entrance we made a left turn and headed down Shafer Trail. This is my least favorite part of the White Rim Trail. It is very rocky and a relatively long steep descent. On some sections, if you went off the trail, you would fall down 500 feet because it is cut into a cliff. When we reached the bottom at 7:43 am there was no truck. Evidently Jack had not noticed the drop box and had driven over to the visitor center to pay the entrance fee. While waiting I took a few pictures of the riders. After the truck arrived we topped off our water and headed out, for a total stopping time of 18 minutes at that spot. Vint and Rian went out ahead, and Mike and Stu were falling behind Jim and I. Jim was riding next to me. Just as soon as he made a comment to me that my mountain biking skills had improved, he hit a bump that knocked one hand off his handlebar and he was headed off the trail. He was able to recover just in time. I thought it would have made a better story if he had taken a fall, but with a trail of rocks and slickrock, no one wanted to fall on this ride. At 34 miles into the ride we came upon Rian, who had stopped to wait. While waiting, Jim was checking his tires and realized the rear was too low of a pressure. It seemed like a good spot to wait for the other riders and the truck. We were not quite sure what happened and it was 15 minutes before they showed up. I guess Jack was having a hard time driving the truck to keep up with the bikers so Mike was holding back. Jim pumped his tire with the floor pump from the truck and we were off, with a total stop of 18 minutes. Rian had estimated that we needed to average 10.5 mph and stop a total of 90 minutes, or we would not finish without lights. But we had now used up half of our total allocated 90 minutes stopping time and had only gone 17 miles from the start going down Shafer Trail. We clearly needed to pick up the pace and keep any more stopping to a minimum. Our next stop was at mile 43 and we were off within 6 minutes. We had some periodic stops along the way and were doing similar quick stops. Keeping up a fast steady pace and short stops left little time to take any pictures but I was able to grab a few at some of the stops. At White Crack (1:24 pm and mile 58), we did take a bit longer break. With 11 minutes I was able to gobble down a PB&J sandwich and drink a diet coke. After another 2 hours we finally reached Murphy (2:15 pm and 65 miles). I knew from past experience that this was one of the hills I would not be able to climb so I got off my bike at the bottom and started to walk up. It allowed me to grab one picture of Rian who was making it up the hill. After another short stop at the top of Murphy we continued on. Mike had promised me no more climbing before the last climb so I kept saying, “hey I would call this a climb” every time we had to go up. Actually we had some real serious climbing up Hardscrable (87 miles and 4:45 pm). This section proved too difficult for me so I was walking part of the climbs but Rian and some others were motoring up them. I could never figure how someone could climb such steep grades with rocks and loose dirt. It was amazing to watch. We now started our descend down to the Green River. I recall last year this section had a lot of sand that I had to walk through this year I was able to stay on the bike. I could see several vehicles stopped on the road ahead. Some group, headed in the opposite direction as we were going, had got stuck trying to pull a loaded trailer with a truck that just had street tires on it. Cars had been stopped behind it. This is a steep section and no room for a vehicle to go around and it was difficult enough just to get my bike around the congestion. They kept trying to put some rocks under the truck tires to get traction but were failing. I decided to bike on down where I saw Vint waiting. It was now 5:16 pm and I was running out of daylight so Jim and I decided to go ahead. But that meant we could not retrieve any water or food, or even our lights, from the support vehicle. I had enough water and hoped we could make it before dark. Vint said he was going to wait for a short while to see if they freed the road, then catch us. Finally we reached my favorite part of the trail, along the Green river. Jim was not feeling that great so we made one stop to take on some more food. While we were waiting Vint and Rian joined us and told us that the trailer had finally got freed so it should not be too long before our support vehicle could continue on. We all continued along together. Rian’s bottom bracket was making a real racket so I was not sure he would be able to make it. At last, at 6:13 pm we made it to the bottom of the final climb up Horsethief Trail. We had figured that we could bike without lights until 7 pm so I knew that I had plenty of time to make the climb. I was feeling fine enough so I went ahead and reached the parking lot at 6:35 pm, with plenty of time to spare before it was too dark to bike without a light. It was a great feeling to finish such an epic ride. I grabbed my camera and took some pictures of the other riders as they finished right behind me. It was getting cold now. Luckily I had kept a jacket in my Camelbak but that was not enough. Rian and Vint had both parked their cars at the top, but both had left their keys in the support vehicle. Fortunately Rian had a keypad so we could get in his car, out of the wind. Another gal was also parked there, waiting for her group who had also been doing the White Rim in a day. Some time passed and no sign of Mike and Stu or any of the riders she was waiting for. One of the riders from the other group finally came in and gave us an update that although the trailer had been freed, it got stuck again. I figured Mike had stayed back to watch his truck and would not leave until it had got through. We were not sure how long it was going to be now. Finally a second rider from the other group arrived and let us know that the trailer had finally cleared the climb. At 7:48 pm Mike and Stu arrived, wearing headlamps. Right behind them was the support vehicle. It turned out to be ideal conditions. Although this time of the year meant less sunlight, the temperature was just about right for such a long ride. I had a fantastic time and the group of guys I was riding with made it extra special. Later I downloaded the data from my Polar heart rate monitor. I had to adjust my distances because I didn’t have things set right for my mountain bike so I was reading 7% low on the distance. Mike got around 100 miles on his Garmin GPS so I used that as the total distance and adjusted things accordingly. Here is a elevation profile and some other data. Click the chart to view enlarged.